Mouni Roy, Naagin and Gold star is one of the sought actresses of television. Earlier today, she took to Instagram to share her picture in a metallic black gown and she looks hot as she poses for the camera. In the picture, she is donning a metallic black gown with a thigh-high cut slit. She has carried the outfit with utmost grace with curled up hair and subtle makeup. Mouni also celebrated her birthday in Greece. Her pictures showing her cutting a cake and grooving to some Bollywood numbers were much liked by her fans. 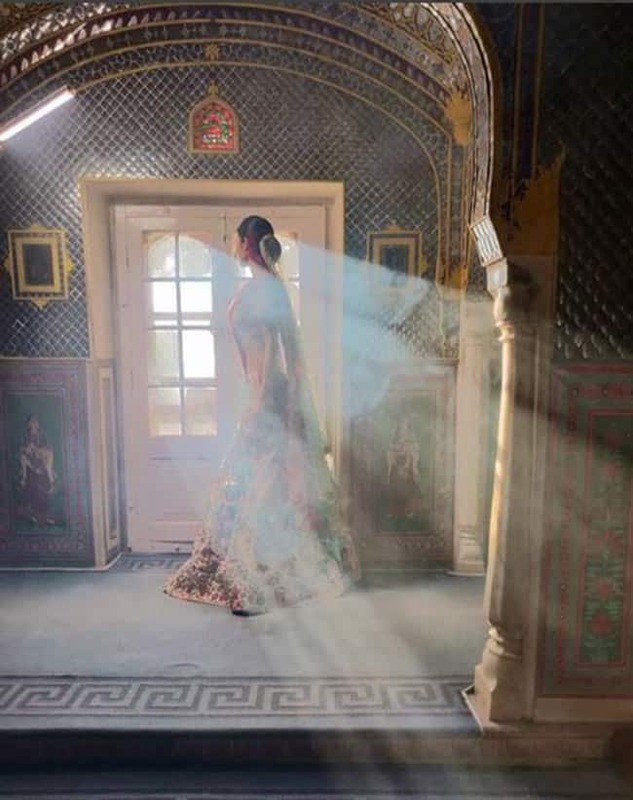 Mouni Roy took to Instagram to share her video and a picture in a perfect bridal look. In the pictures, she is donning a red and blue lehenga. Detailed embroidery, elegant makeup, rose garland and bridal jewellery is giving a glamorous edge to her entire embellishment. 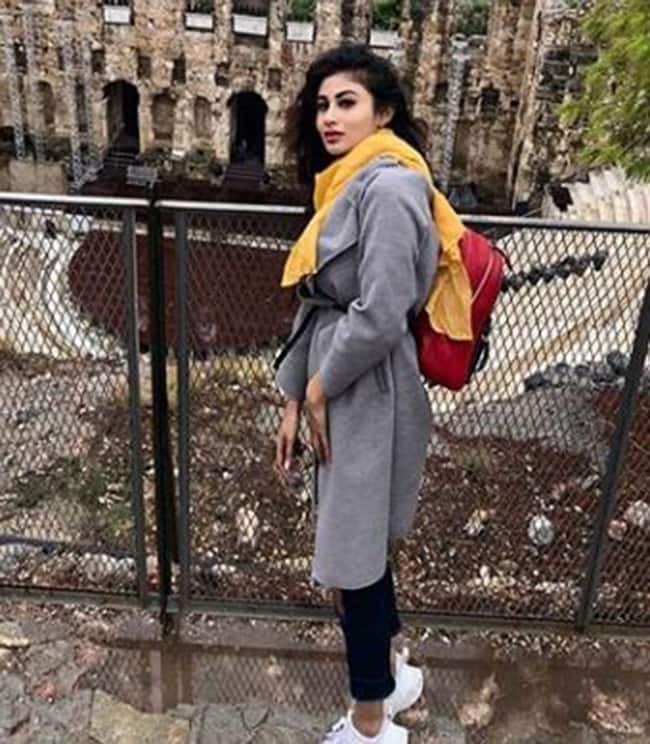 Mouni Roy, Bollywood and television actress, is on a break from her hectic schedule and is chilling with her girl gang – Aashka Goradia, Sanjeeda Shaikh, Sohanna Sinha, Anisha Varma and Roopali Kadyan in Greece. Lately, she took to Instagram to share her pictures in a blue dress and need we say she looked impeccably hot in it? 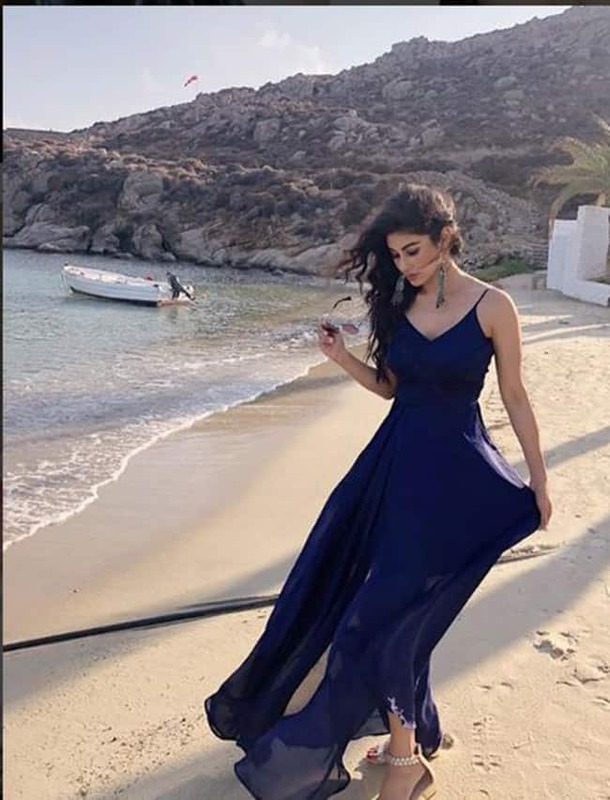 In the pictures, the Naagin actress is donning a blue maxi dress, perfect for enjoying a sunny day on a beach. She can be seen accessorising her look with a pair of white heels, silver jewellery, kohled eyes, subtle makeup and wavy hair. Mouni Roy took to Instagram to share her pictures in a white top and denim ripped denim paired with grey over-coat. She has accessorised her looks with a yellow scarf, white sports shoes, red backpack and subtle makeup. In the pictures, she enjoys the picturesque location and enjoys the historical significance of the place. The Naagin actress is teasing her fans with her hot pictures from the vacation. Earlier today, she took to Instagram to share her pictures in a pastel green dress. Enjoying the picturesque location, Mouni is posing for the camera in a much bubbly manner. The pictures are going viral all over the social media and have garnered more than 86,000 likes in just an hour. She was already loved as TV’s Naagin and after Gold, her popularity rose to another level. The gorgeous lady keeps treating fans with her stunning pictures on social media. Mouni Roy, Bollywood and television actress is undoubtedly one of the hottest divas and what’s more intriguing other than her films or daily soap, is her Instagram page. She never misses giving us sneak peek into her life events and that’s what makes her connected to the massive fan following. Recently, she took to Instagram to share pictures from her latest photoshoot. In the picture, Naagin actress looks ***y as she strikes a pose in a netted black top and purple wrap around skirt. She has accessorised her looks with long dangler earrings, curled up hair, kohled eyes and casual footwear.